Southeast Florida is a dynamic, growing, region, where population growth, during our lifetimes, as we know, has been phenomenal, so much so that the State of Florida has skyrocketed to become the 3rd largest State in the entire country. One factor you may join me in supporting is the concept of "Eastward Ho!" development to meet the needs of increasing numbers of residents. This is the principle that we should develop upward, such as in downtown Miami near the water -- Eastward! -- rather than westward, into the Everglades, which is one of the Natural Wonders of the World. Coral Gables, seemingly miraculously, has managed to resist this exploding population growth, and to retain its suburban nature, and residential charm and character. Even so, the number of tall office buildings has, as we know, multiplied many times over during recent years and decades. We pride ourselves in SMART development in Coral Gables. Here is the contribution I hope to make. 1. The Freedom Tower downtown on Biscayne Boulevard. 2. 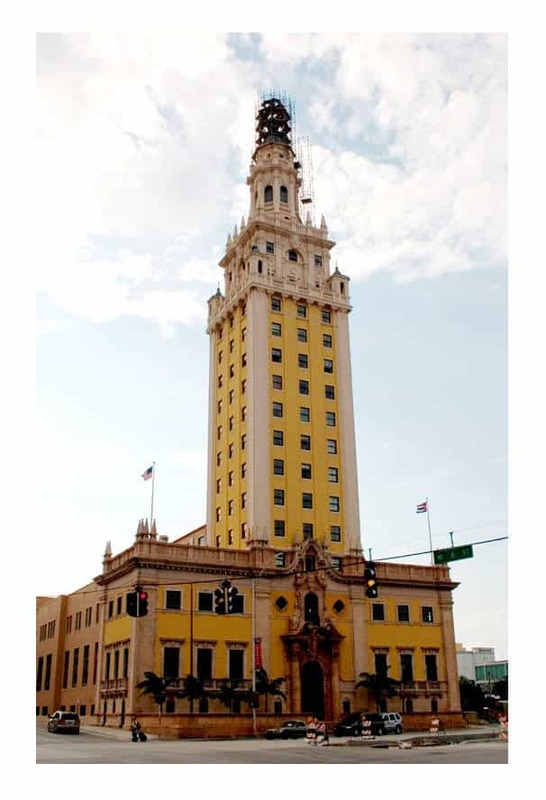 The Bacardi Building on Biscayne Boulevard. 4. The Centrust/Bank of America Tower, with its famous night light display changing colors on the building, as seen on TV shows such as "Miami Vice", and "CSI Miami". 6. Alhambra Towers, 121 Alhambra Towers, a replica of The (Middle Ages) Cathedral of Giralda (in Spain), which opened in 2000. I BELIEVE THAT WE, IN THE "CITY BEAUTIFUL", SHOULD DO EVERYTHING POSSIBLE TO ENCOURAGE OUR DEVELOPERS TO BUILD "SIGNATURE" BUILDINGS, LIKE THE ABOVE, TO PROVIDE DEVELOPMENT WHICH ENHANCES, INSTEAD OF DETRACTS, FROM CORAL GABLES BEAUTY. If our Zoning Code needs minor amendments, to reward 'signature architecture building' developers, e.g. exempting them from "art in public places" requirements, and/or other financial incentives, ala allowing increased height, as does the Mediterranean Ordinance, and conceivably slightly toughening requirements for lower quality tall building development, I think such should be considered, as a means of attaining the important, and desirable, goal, of making Coral Gables one of the "Top Ten Beautiful Architecture Cities in the World" -- a place where tourists from around the world take time out to visit, as tourists to Rome visit Michelangelo's Sistine Chapel. We must bear in mind that most buildings are built on private property, over which, in reality, City government has very little control. Stopping development is not an option, but trying to create, and maintain, the highest standards for same, is something which, if we set our minds to it, we can achieve, extending George Merrick's dream to make Coral Gables One of the "Top Ten Most Beautiful Cities in the World". I want you to know that I am a commercial realtor, and I applied for work with the Coral Gables development department. I am against urban massing, and development which threatens Coral Gables' residential charm and character, but I do believe we can, and, ala "Eastward Ho" development, should actively support development of signature buildings, like the above, which can truly enhance the beauty of Coral Gables. The Allen Morris Company has proven this can be done, with Alhambra Towers. Let's follow their lead, and do it again, no?